Solar energy is slowly revolutionizing the consumer market, and for those new to the eco-friendly industry, there’s no better place to start then with the best solar panel kits. A solar panel kit is basically a solar panel bundled with the essentials you’ll need to assemble and run your solar energy system. They are a dream come true for newbies looking to switch to renewable energy as they cut out the expensive middle man and allow for DIY installation. Solar panel kits are ideal for those looking to power a small off-grid cabin, RV appliances, a boat, or other small electronics. Expensive large load kits are even capable of handling the entire energy consumption of a small household. Depending on your specific purpose, there’s a quality kit out there that will comfortably meet your energy needs. The High Points: Comes equipped with a Rover MPPT charge controller. The Not-So Good: No battery bank included. As one of the leading solar energy brands on the market, Renogy offers superior equipment at a competitive price. From efficient panels to reliable charge controllers, the popular brand always impresses. 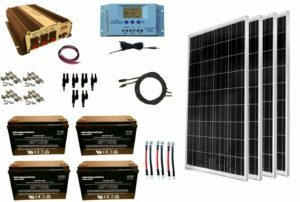 The trend continues with their 400W Starter Kit that comes equipped with a name-brand 40A Rover MPPT charge controller and four 100W solar panels. The kit includes all the essentials, minus the battery bank, which is easy enough to purchase separately. And if you’d like to expand your energy potential in the future, you can purchase additional Renogy panels to connect to the system. The MPPT charge controller can handle up to 800W (24V) of power. The majority of reviewers claim that the system is easy to install independently. However, they warm that the kit doesn’t come with installation instructions, so it’s important to do research beforehand. 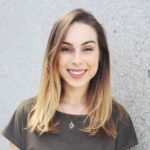 If you have any questions, Renogy’s support team is available to provide advice. Several buyers have used their kits to power vans or trailers with great success. The 400W rating is ideal for small consumption use while still providing location independence. The lightweight design and easy installation is also a key selling point for travelers looking to power their rigs. There have been a few complaints to Amazon because the MPPT charge controller was not included in the package. Some question whether or not there are quality checks conducted in the warehouse before the units are shipped. However, this issue was quickly resolved for the reviewer after sending in a support ticket. Renogy’s solar panels use monocrystalline solar cells, which have the highest efficiency rating. This type of solar cell is also lighter, making it easier to install. The entire kit, including bolts, panels and a charge controller weighs in at a reasonable 90 pounds. Each panel is 39.7 inches by 26.7 inches by 1.4 inches. The kit will need to be supplemented with a solar battery bank. A 300AH gel battery is enough to meet most homeowners’ needs. Alternatively, you can also use golf cart batteries, boat batteries or any other type of power bank to charge your devices. The Rover MPPT charge controller is another quality addition. The Rover model is a top-tier piece of equipment in its own right. Overall, MPPT controllers are more efficient than PWM controllers, which is why we chose the Renogy MPPT kit over the cheaper PWM kit as our best overall. The kit also includes mounting Z brackets, a 20ft 10AWG MC4 adapter kit, and 8ft 10AWG tray cables. The kit can be installed on any off-grid system, including RVs, trailers, boats and cabins. For more specialized kits, like waterproof marine systems, Renogy offers a variety of other options at various price points. However, their 400W starter kit is the best overall option for general use. The High Points: The kit is great for powering small, location-independent consumption systems. The Not-So Good: An expensive price point for relatively low wattage and no included battery bank. 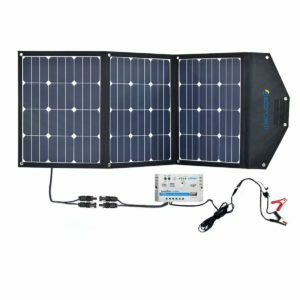 Grape Solar’s unique 540W Off-Grid kit boasts minimal maintenance, easy installation and durability. With a price point that’s more expensive than most other similarly equipped kits, Grape Solar has a lot to prove. However, the well-reviewed system lives up to its marketing; buyers love their kits, no matter the price point. Overall, the kit is best for off-grid systems like boats, RVs, cabins, sheds, vehicles and tiny houses. It’s not suitable for entire households as it only provides enough power to fuel small appliances and electronic devices. With USB ports and outlets, the system is easy to connect to. Like the Renogy starter kit, Grape Solar’s kit doesn’t come with a 12V battery bank. This will need to be purchased separately. Otherwise, all essential hardware, including a charge controller, is included. This makes assembly a breeze as you don’t need to scramble to find the right parts for installation. Reviewers love how easy the kit is to assemble. It comes with an instruction manual that explains the wiring and connectors. However, you will need to build your own frame/panel rack for mounting, which may be a nuisance for novice DIYers. Even at the relatively high price point, buyers claim that the kit is a great value. With its high-quality materials and excellent customer service, Grape Solar’s solar panel kit exceeds expectations. This should be reassuring for anyone who is worried about investing in a more expensive kit. The 540W rating is a good choice for those looking to fully power small appliances, like pumps, solar lights or laptops. It’s an “in-between” option as most kits offer 100-400W of power, or 1,000W+. Overall, the system can produce roughly 1,620W hours or 135A hours of charge per day. The kit includes three 180W monocrystalline solar panels, which are the most efficient solar cells available. The panels are also built with an aluminum frame and sealed junction box, so the system is virtually weatherproof. Durability is an important consideration for solar panels, and Grape Solar hits the mark. Along with the panels, the kit also includes a 40A Comet PWM charge controller. The PWM charge controller is not as efficient as an MPPT controller but it does the job. It also offers mobile monitoring which is great for those on the road. While the kit does not come equipped with a 12V deep cycle battery which is necessary for operation, it does have a 15A inline-MC4 comparable fuse, a 1,800W pure sine inverter with two outlets and a USB port. The USB port is particularly useful for plugging in small devices. The High Points: Can fully power small-sized households or work as a backup source for regular homes. The Not-So Good: Not ideal for those looking to dabble in solar panels. Renogy, the top-tier brand that topped our list with their 400W starter kit, also offers a variety of other systems. The 3600W Solar Cabin Kit is a powerful addition to any small household. With advanced panels and a host of high-quality equipment options, the kit is ideal for remote cabins, off-grid residences and commercial rooftop systems. Although the price tag may seem startlingly high for newbies in the DIY solar market, it’s actually a reasonable cost when considering the size of the bundle. 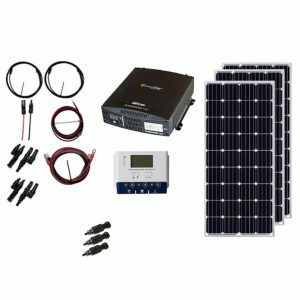 The kit comes with a MidNite Classic MPPT charge controller and a MidNite Solar MNPV6 Combiner box. However, you will need to purchase a 48V battery bank separately. Overall, reviewers are pleased with their purchase. Few buyers have left comments, but those who have are satisfied and have not had issues with installation or output. One reviewer claims they haven’t yet experienced any problems after a year of continuous use. However, a buyer claimed that no instructions were included in the kit. This may be an issue for those who are not familiar with solar power systems. If this is the case, it’s best to reach out to Renogy’s customer support for assistance. The kit comes with twelve 300W monocrystalline solar panels. The panels use PERC solar cells, which are more efficient. Overall, each solar panel is 15-20% shorter and lighter than a regular 72 cell 300W panel. The solar panels are able to withstand high winds (2400Pa) and snow loads (5400Pa) should you live in a climate with frequent inclement weather. This durability makes it ideal for rooftop mounting on residential or commercial buildings. The panels also boast the ability to perform well in low-light environments. In each kit, you’ll find a MidNite Classic 150 MPPT charge controller. This industry favorite is a leader in remote monitoring and offers a wide range of features and more control over the system compared to PWM charge controllers. There’s also a MidNite Solar MNPV6 Combiner Box, another popular piece of equipment, which is rated for outdoor use. Renogy guarantees a positive output tolerance (0-3%). They also offer a 25-year power output warranty on the panels, a 5-year material warranty and a 1-year accessories warranty. This may ease potential buyers’ concerns about the upfront investment in an entire system that’s not backed by a professional installation and solar service company. The High Points: A unique, flexible design offered at a low price point. The Not-So Good: Doesn’t offer the ability for expansion as you’re limited to a low number of panel connections. The 100W solar panel kit by ALLPOWERS is a great option for new solar DIYers or those looking to power small devices. Although the kit is cheap, it still offers some great perks, like a flexible panel, 18V output and super simple mounting design. Not only that, but ALLPOWERS boasts a 21% panel efficiency rating, compared to the standard 15% of other panels. Although there are certainly cheaper 100W panels on the market, the ALLPOWERS model rises to the top because of its quality and features. However, be aware that you will still need to purchase a battery bank and charge controller separately which will significantly increase your overhead costs. Purchasers are pleased with the overall quality and capacity of the ALLPOWERS solar panels. Various verified uses include camping vans, boat refrigerators, charging iPhones, water pumps and tiny houses. The wide range of applications make this a great option for most buyers. However, one reviewer claimed that they faced issues when connecting two panels in a series. The voltage dropped and the reviewer did not know if this was a result of faulty panels or their charge controller. Whatever the cause, this may be a red flag for those looking to expand their system for higher capacity output. ALLPOWERS solar panels offer a relatively innovative feature: flexibility. The SunPower panel is semi-flexible and the plastic back sheet can be bent into a 30-degree arc. This flexibility means that it can be mounted on a variety of irregular surfaces, like cars, trailers or boats. The 100W solar panel is made with monocrystalline solar cells, which have a high conversion efficiency rating. Each panel only weighs 4.1 pounds, making it easy to transport and install. The unique frameless design with pre-drilled panel holes is also an added benefit for those on the go. ALLPOWERS recommends that you should not use more than 2 panels in parallel with a PWM controller, or 4 panels in a series connection with an MPPT controller. This means that the total wattage available is fairly low, and you are limited by the number of panels you can install. You will also need to purchase an 18V battery bank and solar charge controller. The High Points: Unique “suitcase” design makes it very portable and easy to transport. The Not-So Good: Design flaw with the wiring to the charge controller. For those who are perpetual nomads, the ACOPOWER solar panel kit is here to meet your needs. With a useful and unique folding panel design, the kit makes assembly and packing up a breeze. The lightweight and compact panel construction means those who are always on the go can tuck their panels in the trunk or stowaway compartment when you aren’t using them. The panel kit also comes with a LandStar 10A PWM charge controller. This also includes a USB output and alligator clamps for battery charging. You can tuck these extra additions away into the front pocket of the “suitcase” for easy access. With a variety of bells and whistles, the ACOPOWER kit is an incredibly affordable option for those looking to power appliances on the road. 105W is all the power you need to charge laptops, phones or other essential devices. You will not need to do any setup, including tools or wiring. Simply stop your RV, pop out the standing legs and start charging. The quality of construction and efficiency of the ACOPOWER portable kit thoroughly impresses reviewers. Successful applications include RVing, disaster relief and camping. People have even used this all-purpose kit in stationary capacities, like a household. One reviewer claims that it outperforms other similar models made by other brands. The peak efficiency rating was consistently higher. This should provide confidence for those comparing other brands and/or models to ACOPOWER’s 105W suitcase kit. However, some have had issues with the panels being too delicate. The crimp-on wire ends that secure the controller have a gap which exposes the wires. This can become an issue in the future if it isn’t fixed. Perhaps the greatest selling point for ACOPOWER’s solar panel kit is its unique “suitcase” design. The panel is actually three separate 35W panels mounted on a foldable surface. This tri-fold option is great for those looking to regularly transport their panels, like those traveling in an RV or on a boat. The entire compact kit is only 7.9 pounds and can be reduced down to a size of 22 inches by 17 inches by 50 inches. The laminated panels and mounting surface are also weather-resistant and can be safely used in rain. The panels come equipped with a back prop stand for easy and quick assembly on the go. The kit comes with an SAE connector for pre-wired Zap Solar RV or campers. You can also purchase additional adapters from the company. On top of that, you will need to acquire a 12V battery that’s compatible with your devices. The High Points: Comes fully equipped with a charge controller, inverter and battery bank. The Not-So Good: No choice in equipment as it comes fully bundled. As one of the more popular brands in the DIY solar market, WindyNation is known for making reliable equipment. Their 400W comprehensive solar panel kit is no exception. 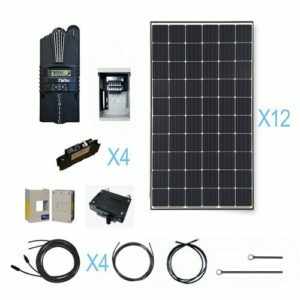 If you’re looking to completely eliminate the need to research and purchase additional accessories for your solar system, then this kit is for you. The kit comes equipped with everything you need to create a solar panel system from scratch. It even includes an inverter and four battery banks. However, one downside to this bundled option is that you have no choice in accessories and must accept the models they provide, regardless of the quality. The WindyNation kit is a reasonable price for the number of items you receive. It’s a cost-friendly option for those looking to start their first solar power system and newbies who don’t have the knowledge or expertise to select the necessary components. Overall, WindyNation’s all-inclusive kit is great for powering small devices and appliances in cabins, RVs, or small households. Reviewers appreciate the comprehensive scope of the kit. It really does include almost everything you need to begin. Some have chosen to purchase additional hardware or accessories to customize their kit. However, this is not necessary for installation. One reviewer claims that the inverter is not good quality. They also found the wires that come with it to be too short for general use. These may add a few extra hundred dollars to the overall price if you need to replace or repair the defective items. As one of the most comprehensive kits on the market, the WindyNations 400W kit packs a punch. It includes four 100W panels, a 30A solar charge controller, a 1500W VertaMax power inverter, four 100Ah BattaMax deep cycle batteries, a variety of cables and mounting hardware. The equipment is fairly basic and doesn’t offer the most advanced technology. The panels are polycrystalline, which isn’t the most efficient, and the charge controller is a PWM rather than MPPT model. However, the comprehensive scope of the kit is great for those looking to eliminate the stress of finding the right components for your system. The included 1500W inverter works to convert DC to AC power, which is ideal for running household appliances. You can also use it to power RVs, cabins, boats and backup systems. On average, the panels provide 1600W hours of charge per day, depending on available sunlight. What will you be using your solar panel kits for? Will your solar panel kits be used on an RV or boat? Do you already own an external battery bank or solar charge controller? Are you an expert in solar panel systems? Before diving deep into the world of solar panels, you should first consider a few different variables. We’ve covered several of the most important questions, although there will be more depending on what you plan to power with your solar panels. As with any big purchase, it’s important to determine why you want to invest in a piece of equipment. 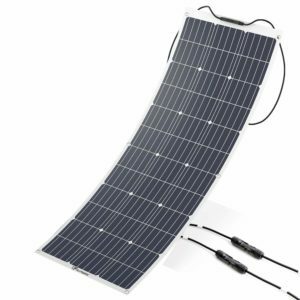 There are several different scenarios that call for a solar panel kit, and each one requires different hardware and accessories. By determining your specific needs before purchasing, you’ll save money and time down the road. One of the biggest considerations is whether you want to power a small or large system. Generally, small loads (like small appliances) can be effectively run off of 100-600W systems. Larger loads (like entire households) will need a minimum of 1500W. Most DIY solar panel kits run in the range of 100-400W. If you’re looking to power appliances on the go, you’ll need something more portable. Most standard solar panel kits are designed to be permanently installed in one location, whether that is on the roof or the ground. You can certainly permanently install a panel on the roof of an RV, but this may not be the most suitable option for everyone. There are several portable solar kit models that are designed with travel in mind. They offer features such as foldable or flexible panels, pre-wiring, pre-drilled holes, pop-out stands, lightweight materials, and durability. Generally, these kits are 100-200W as anything more would take up extra space and double the weight. If you’re looking to use your solar panels to charge your boat batteries or appliances on the water, rather than while parked on land, you’ll also need marine-friendly equipment. Some kits offer marine charge controllers and waterproof panels. However, it may be best to purchase a solar panel kit that doesn’t include a charge controller, battery bank or inverter. That way you can purchase the best marine equipment separately to guarantee quality in extreme conditions like water exposure. For example, running four 50W light bulbs (a total of 200W) for 8 hours would mean a total daily electricity load of 1.6 kilowatt hours (kWh). If you receive an average of 5 hours of sun per day and are purchasing 100W panels, then you’d need 3.2 panels. This means 4 100W panels would comfortably power your light bulbs. No matter what you plan on charging with your solar panels, you’ll always need a solar charge controller and a battery. Most kits don’t come equipped with both. Generally, more comprehensive kits will include a charge controller (MPPT or PWM), but not a battery. You’ll need to purchase these essential accessories separately if you don’t already own the equipment. Depending on the type and model you decide to use, this can drastically increase the overall cost of your solar system. Keep in mind that MPPT solar charge controllers are more efficient (and expensive) than PWM controllers. Solar Panel Kit Solar Charge Controller Included? Battery Included? Most homeowners are unfortunately not experts in solar panel systems. However, this shouldn’t be an inhibitor to installing an eco-friendly and cost-effective solar panel on your home. Modern technology has made it so it’s relatively simple to install solar panels on your own. If you’re new to the solar market, a more comprehensive and well-equipped kit is the best choice. Rather than fussing with the technical details of which extra battery bank or charge controller you should buy, you can simply purchase all of it in one bundle. These are sometimes more cost-effective as well, although you won’t have much control over the quality of the extra equipment. Keep in mind that most companies offer excellent customer support services and are able to answer any technical questions you may have. If you encounter difficulties installing or maintaining your system, it’s always best to give them a call and consult their experts if you aren’t one yourself. Solar panel systems are relatively delicate, rather expensive, and sometimes dangerous if not handled properly, so it’s important to know what you’re doing before making any modifications or purchasing decisions. 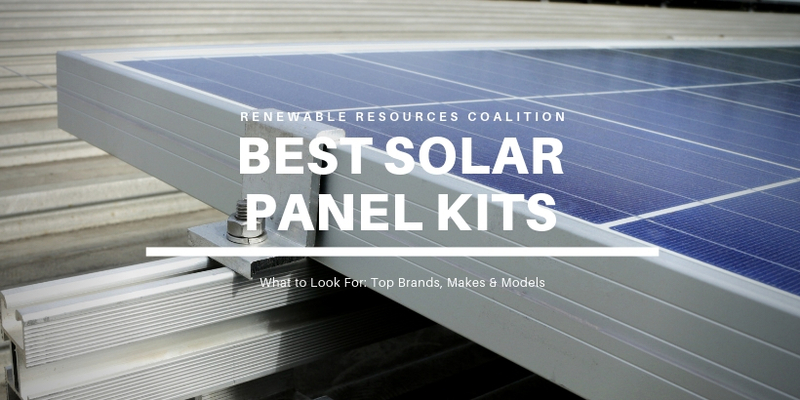 Based on our specified criteria, we’ve narrowed down a competitive list of options to feature the 6 best solar panel kits. Our rankings place a special emphasis on reliability and value for the money. They also take into consideration the quality of the equipment, the wattage, the volts and the designated use. Most standard solar panels are 100W. Each kit can contain anywhere from 1 to 12+ panels, with a combined wattage of 100W to over 4,000W. The combined wattage is a determining factor for whether the kit can be used for small or large loads. The average homeowner is looking to power a few small devices or appliances and will only need a small load kit. A minimum of 100W is enough to power a laptop or refrigerator. Our rankings base the standard wattage at 100W and will not include anything less as it is relatively useless for practical applications beyond powering a single light bulb or charging a phone. We’ve also included a max wattage of 3,600W as most homeowners will not need more power than this kit can provide. The number of volts the kit produces will determine the type of battery you will need to purchase. Generally, most panels produce 12V. However, larger capacity kits can service up to 48V. You’ll need a minimum of 12V to power basic appliances and devices. If needed, you can also purchase an inverter to convert the volts from DC to AC for more specialized uses. Each kit will come with solar panels, some variation of wiring or connectors and hardware. More comprehensive kits will also include solar charge controllers, batteries, inverters and specialized hardware. The more equipment that’s provided, the better, as it generally costs less to bundle items. Also, you’ll know with certainty that all parts are compatible. Some may opt to purchase their own equipment as it offers more room for customization. For example, those looking to install a panel on a boat or in an RV will need different features. In this case, it may be better to purchase a simpler kit that just provides the panels and hardware. What’s the difference between polycrystalline and monocrystalline panels? Will I need to purchase extra equipment or accessories? Do I need to hire a professional to install the solar panels? Depending on your needs, most solar panel kits are incredibly affordable for the average homeowner. Those seeking to power small loads can find kits for as low as $100. However, if you’re looking to power a large load, like an entire residential building, then you’ll need to cough up $5,000 or more for all the equipment. Solar panels are an investment, rather than an expenditure. Considering the average residential utility bill in America is more than $100 per month, your investment will pay itself back in as little as a few years. It also has the added benefit of decreasing your reliance on non-renewable energy sources and location dependence. As technology continues to advance, solar energy systems will continue to decrease in price. Most companies also offer warranties of up to 25 years, with additional warranty options for efficiency ratings and accessories. While the upfront cost may seem like a lot at first, it’s a worthy and safe investment for homeowners looking to go off-grid. The material the solar panels are made of affect the efficiency of the overall unit. Solar panels are generally manufactured with either monocrystalline or polycrystalline solar cells. They are both made from crystalline silicone. Monocrystalline panels use a single continuous crystal structure, whereas polycrystalline panels use many. Monocrystalline panels are more efficient because they are made with the highest-grade silicon. Some industrial panels can convert as much as 22.5% of sunlight into energy. These panels are also lighter and smaller because they require less space to produce equivalent results. Most kits don’t come with a battery, so you will need to purchase that separately. Otherwise, you may need to purchase a solar charge controller if it’s not included. MPPT controllers are the most energy-efficient, whereas PWM controllers are a cost-effective option for small loads. All of the kits that we’ve featured in our rankings are able to be installed independently. They don’t require any special tools or know-how and relative novices can assemble them if they have thoroughly read the instruction manual. For those with little to no experience in electrical engineering, it may be best to consult a professional before messing around with wiring and electrical components.